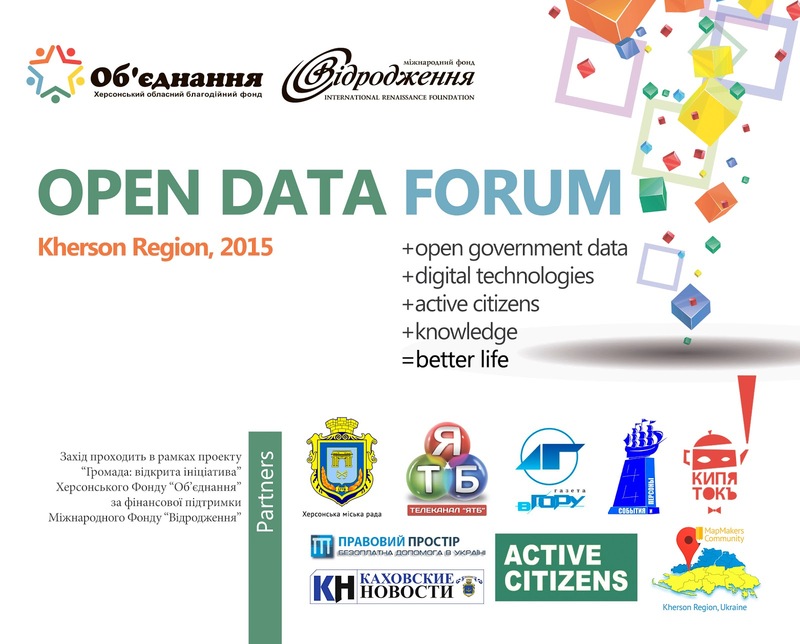 The first regional Forum of open data was held August 26, in Kherson, which was attended by over 80 representatives of NGOs, governments, businesses, educational institutions, media and active citizens from Kherson region and other regions of Ukraine. At the Forum were discussed such questions as: use of modern digital technology in the field of open public data to increase the investment attractiveness of the region, activity of communities in the management of their own cities and there were presented already existing projects in this field in the Kherson region. Forum was organized by Foundation "Union" within the project "Community: opened initiative" with the financial support from ICF "Renaissance" and Kherson City Council. Forum was opened by the Mayor of Kherson Volodymyr Mykolaienko. Deputy Mayor Victor Ivanushkin presented achievements of Kherson City Council in the use of digital technology to build open government in Kherson. Kulchytsky Alexander, PR-manager of the Center for Political Studies and Analysis described the web-program "Open budget" that can be implemented in different cities. Oleh Yakymchuk, Director of Relations with the authorities of Google company, presented a new web-project "Land Investment Map of Kherson", which was developed within the program of "Digital transformation of Kherson region" in partnership with the Foundation "Union" and Kherson City Council. Management of communal ownership of Kherson City Council presented the Map of communal property. To put Ukrainian case in the broader international context, DHRP expert on Good Governance and Civil Society Diana Zubko presented the latest legal changes in Ukraine in line with the best world practices. Member of the City Council Ihor Kozakov presented two projects: "Kherson Map of districts" and "Map of works of Kherson water utility"
Mike Waldron from UK and Vitaliy Tyhonovich from British Council in Ukraine were presented program "Active Citizens"
Chief Inspectorate for Control over landscaping and sanitary condition of the city of Kherson Elena Mazur presented new web-project "Public inspector"
Veronica Grishchenko, the representative of the American Councils for International Education: ACTR/ACCELS told about the educational opportunities provided by the US Embassy and American Councils for International Education in Ukraine. Zhanna Ebert, project manager, opened the essence of the project "Community: opened initiative"
Yuriy Antoshchuk, head of Foundation "Union" gave a presentation on the development of investment attractiveness of the city using public online maps.